Happy Wednesday, fans! Some of you might be ready to enjoy the shortened work week - and looking forward to the weekend as much as we are! For our latest post, The Sock Review proudly features an amazing lineup of sock styles from Strideline, a Seattle-based company that focuses and strives for ultimate comfort, style and innovation in their product. Strideline was kind enough to send over a variety of styles for us to to check out - thanks, guys! As with any sock review, we start with no expectations, and an open mind; a fresh palate, so to speak, because we know each sock is unique in its mission. We must say - the Strideline socks did not disappoint! From the smooth fit, to the attention-to-details in design, we’ve got good things to say - read on to hear more! After releasing these mighty socks from their sleek packaging, it was quite refreshing to see that pop of color on the bands; an orangish-red that you’ll later discover elsewhere on the product. This kind of detailing is something that any design-enthuiast can appreciate, and connects well with the branding. Anyone out there have a pair of Strideline socks? Add your comments below - let us know what features make these socks stand out to you! It’s our experience that basic color socks (or neutrals) like black, white and grey, can easily get boring - but not with Strideline. With what is seemingly just ‘the right amount’ of ‘heathered’ yarn use, the design and comfort features of the sock are appropriately accentuated by the coloration, and would easily provoke a ‘pick me, pick me!’ response while shopping in a store. Considering the packaging, the ability to see and feel good quality in the product - from a visual and tactile standpoint - we give Strideline a ten! Strideline socks offer a striking design; the cushion, specialized yarns, and packaging really make it work. Next was the wear test; and photo session - what better way to understand a pair of socks than to try them on? We even took them out for a ‘swing’ on the golf course over the weekend. First impression: Very well-cushioned and comfortable, and easily pulled on and off. They felt lightweight and easy to wear with sneakers. Interested in learning more about what makes up a pair of these socks? You can read more about the construction here. It was easy to tell from the first step onto a hard surface, that these socks were built with some well-thought out cushioning placement. It seemed like they offered padding on all the right spots - and when worn throughout the day, really just felt good the entire time. Once taken off, no signs of being too tight or leaving marks. The materials and structure help keep the sock staying where it should! (That is, not sliding down your leg). Do you have a favorite sock height? We absolutely love the Mid Sock length - it’s a very versatile and modern sihouette, don’t you think? The low/ankle styles are great for the summer, and crews are great for ‘showing off’ at the gym, or if you prefer more of a classic look. Each one offers a unique way to accessorize your outfit, sports attire - or just hanging out in! Here, you’ll see a Strideline pair in its element - even as standalone objects, they look swift! We love how detailed each sock is; it’s quite evident that a lot of thought, care and even fun went into these designs. From the knit-in frontal ‘STRIDELINE’ text logo, to the selective placement of padding, ribbing and textures, there’s much to look at, and makes for an interesting pair to wear. Pictured here is the low/ankle style, available in different colors - check out the availabilty on their site. You can see the ‘L’ and ‘R’ knit in, indicating which foot it fits best. To tie it all back to the beginning of our wonderful journey with these socks - you’ll notice again, that orangish-red color popping up from the inside of the ankle. It makes for an interesting contrast, and works really well as a part of the branding and look of the socks. There is still more to Strideline than the basics - be sure to check out their line of Fan Wear, link here. The Lifestyle collection is pretty neat too! From men’s to women’s…to even kids and custom inquiries - Strideline has a lot to offer. That’s a wrap! Thanks again to the Strideline team for sending over samples! We’ll definitely wear these again. We want to hear from our fans! Let us know which styles you’re interested in trying - or if you have a pair, let us know how much you love them! Disclaimer: The Sock Review was provided with free product in return for an honest review. All thoughts and opinions expressed herein are not influenced by the developing company, and/or its affiliates, in any way. The Sock Review is not responsible for, nor can it provide any guarantee on any of the products described on the blog or on social media. Front and center: Sock designs by SlySocks - based out of L.A.
Ready to go for a Joy Ride? Pretty sure you can have lots of fun while wearing SlySocks’ ‘Joy Ride’ design - favorite design! 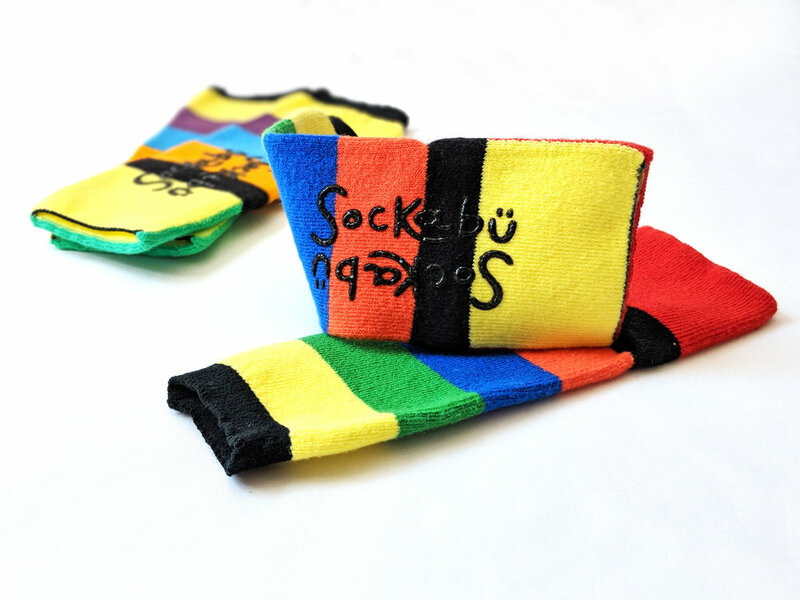 SlySocks wants their audience to connect with their designs - each one, a unique story to tell. The socks are mainly cotton, so they’re very comfy and easy to pull on. Being a one-size-fits-most seems to work out, as our sock model, Nik, didn’t have any issues with the wearability. With such lively designs, we wanted to emphasize the bold blues in the Joy Ride style, pictured above. Amusing, don’t you think? Speaking of… this pair reminds us of amusement park rides, indeed - how perfect for the Summer! Catalina Dreaming - sail away with this pair of socks from SlySocks! Next, we found our sea legs with the Catalina Dreaming pair - absolutely love the colors here; it’s not your ttraditional navy-blue nautical style, but instead, offers just the right amount of color contrast to spark a conversation. This style offers a warm and friendly vibe; definitely a ‘Yes’ in our book! With a well-timed visit from some rain clouds, we were able to capture this water-worthy pair in its element. These would easily pair well with some shorts and a tee for a carefree look. We’d love to hear what you think so far; which SlySocks designs are your favorite? Is there a pair that is a ‘must have?’ Let us know in the comments below! Send some positive vibes by letting SlySocks know why you love their designs. A Set of Superbly-Stylish SlySocks! Add a splash of color into your sock drawer - those foxes are looking fabulous! Funny Like a Fox - who could resist a pair of socks with foxes on ? Last, but not least - how could we pass up an opportunity to show off these foxy-socks? From the embroidered fox on each of their styles, to the character on the packaging; the fox is (literally) knit into the brand, and ties the collection together. We sincerely hope you’ve enjoyed reading about SlySocks on The Sock Review! Loved what you see? Need to get a pair of your own, or give as a gift? Check out the links below for more info, and some social media shout outs! Thanks again, SlySocks - it was our pleasure! SHOP these Looks - Which style fits your fashion personality? Where to purchase: https://www.slysocks.co/ *Use offer code SOCKREVIEW to get 40% off your order! Disclaimer: The Sock Review was provided with free product in return for an honest review. All thoughts and opinions expressed herein are not influenced by the developing company, and/or its affiliates, in any way. The Sock Review is not responsible, nor can it provide any guarantee on any of the products described on the blog or on social media. 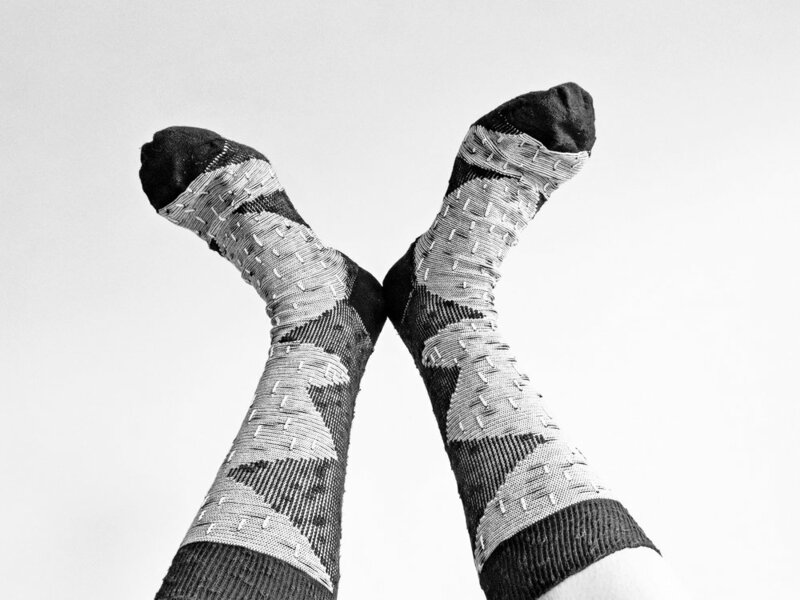 Arkansocks offers state-inspired patterns - check out the styles below! Build up your collection of statement socks with Arkansocks. Arkansas; a state filled to the brim with historic sites, roadside attractions, natural wonders, and of course, home to Arkansocks - the sock, clothing and accessories company that got its start in the capital city of Little Rock. 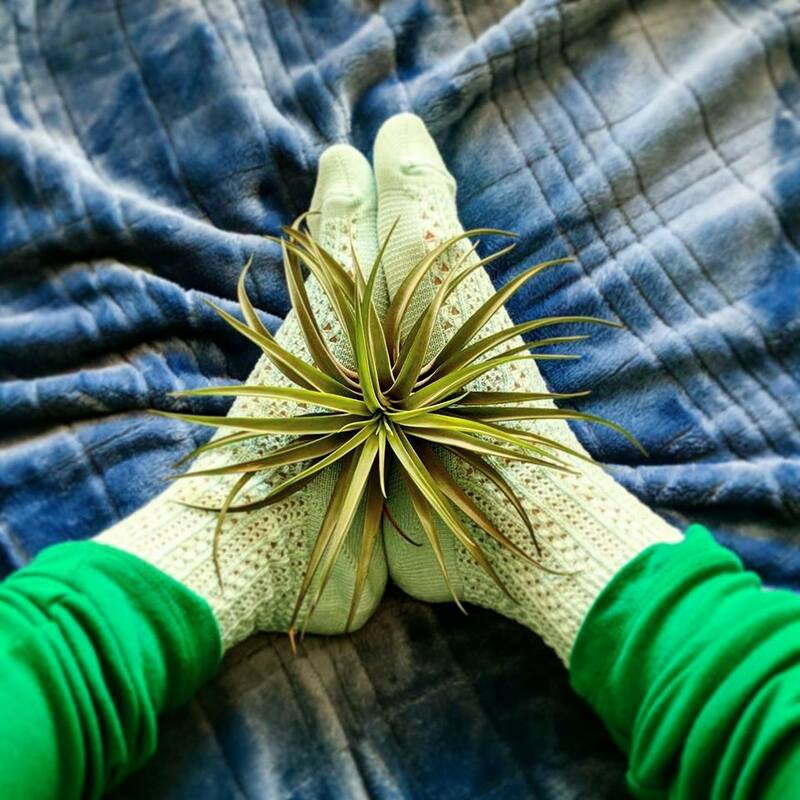 Arkansocks’ unique designs ‘naturally’ celebrate the culture and beauty that the state has to offer. Let’s dig in! Lovely design work; the colors are majestic, like the Ozark Mountain Region. It’s always a pleasure checking out new sock styles and brands; there’s always a sense of ‘newness’ that is inspiring to see. The Arkansocks collection includes both knit-in and printed designs, of which you can see in these photos, and on their Instagram - be sure to send some positive vibes their way, and let them know which styles are your absolute favorite. (Mine is the ‘Socksquatch’ inspired pair). Find your favorite style on the Arkansocks website. It may be subtle (and that’s what is so neat about it), but you can see in the argyle-patterned socks in the photo to the left, that instead of a traditional diamond, the silhouette of Arkansas is used. These would make great gifts for any Arkansas resident or visitor. Planning a trip to Arkansas, now that you’ve been properly inspired? Check out the official tourism site, here. So much to see and do! Here is just a sampling of the Arkansocks collection - be sure to check out the links below for more info and patterns. Well, that’s a wrap - hope you all enjoyed the journey through Arkansocks - be sure to visit them online, and interact with them on social media. Special thanks to Arkansocks for sending over the styles; a perfect addition to any sock collection out there. Disclaimer: The Sock Review was provided with free product in return for an honest review. All thoughts and opinions expressed herein are not influenced by the developing company, and/or its affiliates, in any way. The Sock Review is not responsible, nor can it provide guarantees on any of the products described on the blog. Embrace the Gym, or the Couch? Socks Comfy Enough to do Both! Happy rainy day, readers! It’s Sunday; the day before the work week starts, and the Winter weather has finally hit. While a few flurries of snow showed up yesterday here in Virginia, today is a mush of slush & rain - So…while I wanted to be brave and venture out to the gym, I decided to stay nice and warm inside, instead! I had already pulled on some socks from Puma, and considering my final decision to stay indoors, I decided that they would make a great pair of lounge socks as well. Getting back into things with The Sock Review; reviews take time, so we appreciate your patience as we organize. We appreciate the submissions we receive via the blog contact form, and we’re excited to see what’s in store this year for The Sock Review! We're Trying Something New ~ Thank You for Your Patience! Hello, friends, fans, and sock adorers…just letting you know that we’re in the works of trying out some new things, as well as improving our submission process! We have quite a few submissions to sort through, and we thank you for your patience - don’t worry, if you’ve submitted, we’ve got you in line to check out your brand; We’ll be reaching out as soon as we get organized. Happy Tuesday, fans and friends! It's a beautiful morning over here at The Sock Review, and we're so excited to bring you our latest sock brand feature - the company that celebrates mischief and challenging the norms; Quiet Rebellion! 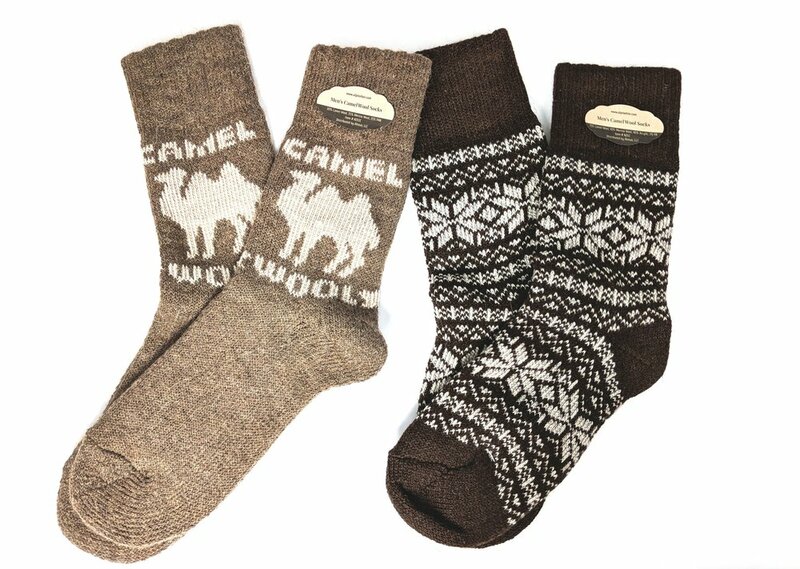 Hailing all the way from Australia, these socks are inspirational and made with luxurious combed cotton (yes, they're very soft!) We absolutely love how the hidden patterns allow the user to show off their inner fashion rebel, and feel comfortable at the same time. Quiet Rebellion socks are designed in London (where the brand originates) and are made in Turkey. What's interesting and unique about Quiet Rebellion socks is the way the patterns can be hidden when wearing shoes, but inside those shoes...you know what you've got going on -Some amazingly fun and conversational sock styles, that's for sure! There is also a hidden pattern on the inside of the cuff/welt; so you can flip them over for some extra mischief. ;) Such a creative and unique approach to legwear design. Check out some of our photos below; we had a total blast trying QR socks on for ourselves! A big thanks to the QR Australia team for sending us a few pair! Meet 'The Rebels' - so, this concept of celebrating the inner rebel is backed up with some pretty cool historical figures and their stories of how they were able to challenge what were the sort of 'norms' of society at the time. From the ancient Egyptian architect, Imhotep, who designed a step pyramid and other architectural wonders, to Annie Taylor (the first person to go over Niagara Falls in a barrel, how cool!) These fun sock designs compliment the historical figures and their 'feats' well, and give a nod to their unique contributions to the world. Be sure to check out all of the stories with the link above! So, we love the designs, we love the 'out-of-the-box' thinking, and we love the quality; Quiet Rebellion, we think you do great work, keep it up! To the left, we wanted to show off how well-thought out the design intent is; in this example, the cuff/welt is flipped down to show off the design, but you can see when shoes are worn, your 'inner rebel' is secretly celebrating - that little bit of fun can make for a great day. Should you need to remain professional-looking at the office or out to dinner, these socks make it easy to still be yourself :) *and who doesn't want to be themselves as much as possible? To the right, we're showing off some of the hidden patterns available online, with sizing available in small or large, and fitting a range of shoe sizes. That way, you're not limited to a specific color or pattern; and anyone can celebrate their favorite 'rebellious' figure. Loving the bright colors, grounded with the black/neutral body, which essentially allows you to pair and wear with anything. These socks would definitely make a great addition to any sock aficionado's sock drawer. Alright friends, that's a wrap! 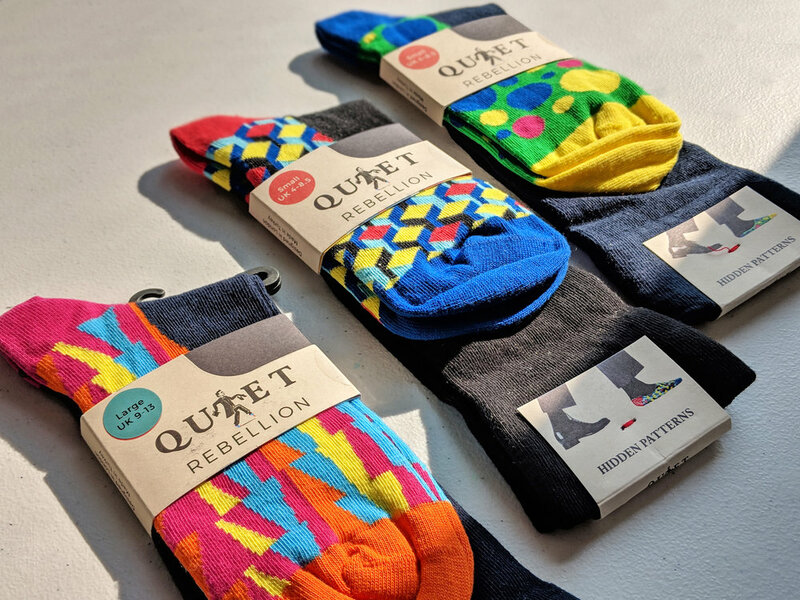 Quiet Rebellion socks have a place in our sock drawer, for sure. Be on the lookout as they expand in styles and stories! You can follow them on social media and see what they're up to next - and show them support or comment below with your favorite QR styles from our post. Thanks for reading and we'll see you next time! Happy Tuesday, readers - and a new day to celebrate the wonderful world of socks! A few weeks back, we highlighted family-owned and operated sock company, Feetures. Their comfortable and quality crew designs had us coming back for more, so we were lucky enough to get our hands on a few pairs of Feetures' latest 'Hidden' collection! A big 'Thank You!' to Feetures for providing some socks for us to check out. We definitely wanted to share our thoughts on the overall design, feel, and construction elements that make these invisible no-show styles an excellent investment into your summer wardrobe. What makes them 'hidden' is their ultra low cut, creating an illusion of not wearing any socks (perhaps under your favorite loafers or sneakers, when you don't want to sacrifice the comfort of wearing socks, but don't want to particularly show off your socks). One of our favorite conundrums in the sock world, is the constant battle to find no-show socks that don't just slide right off when you're wearing them. 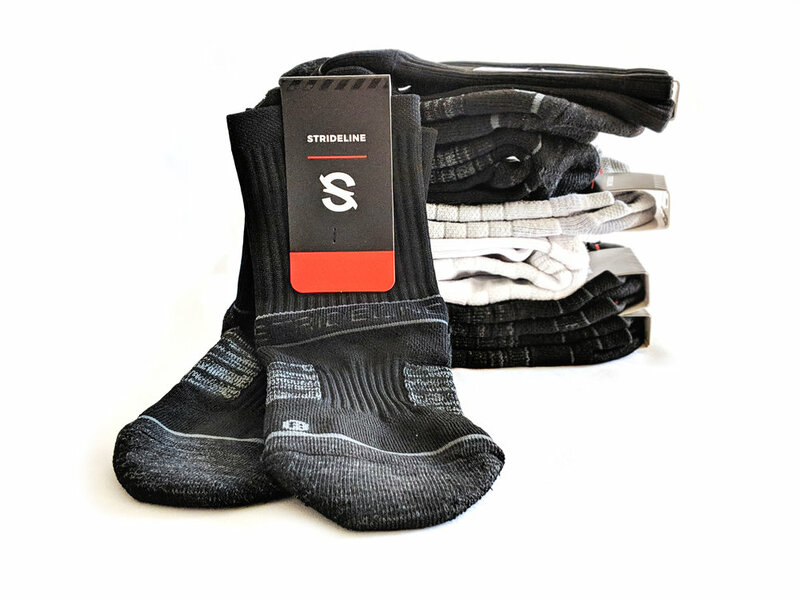 To work against the laws of 'sock nature,' Feetures has included 'Heel Hugger' technology, non-slip grip and arch support in their styles; to keep your socks from slipping around inside your shoe. In addition, a seamless toe is incorporated in the front, to help avoid blisters. That, we can be grateful for; when it comes to quality and durability in socks, you get what you pay for. What's great about Feetures socks is that they come with a lifetime guarantee - that's pretty amazing customer experience if you ask us! We'll talk a little bit more about the designs here; we absolutely love the variety available. While there are colorful options (pictured here), if you want to go a little more neutral, there are styles that will suit your needs. You can find these options and more on Feetures online shop. P.S., we love the shopping experience on their site; you can shop by silhouette, collection, popularity or even activity! Do you have a favorite outdoor sport or Summer event that you participate in? We'd love to hear what you think is important as far as socks go, during those activities. Let us know in the comment section below. On the Women's Hidden styles, we love the use of the satin-type elastic at the opening; a lot of times, we'll see a matte elastic used in this particular silhouette, but we've got to give some kudos to great design choices here with this upgraded look. As far as the women's styles go, our top favorite is the Women’s Hidden Super Low Floral in Lavender; we love the feminine color and pattern; florals are always key in Summer style, and the colors are spot on for this lifestyle group. Moving on to the Men's collection - we like the slightly higher cut on the front of the sock; shoe-friendly for the guys, and have that seamless feel that makes them easy to slip-on when you're in a hurry. The stripes come in a few different colorways that offer a fresh look and easy to pair with whatever you're wearing. Again, for the guys that prefer a more neutral look; solids are available as well. Take a look at some of the options below, and be sure to view more details about each one online! Overall, we have to give excellent marks for design, construction, quality and comfort - great job, Feetures! We hope you all liked this week's sock feature on the blog; be sure to check out our social media shout-outs and stay tuned next week for more sock-feed. The nice guys over at The Dapper Collection were kind enough to send over some samples to review. They arrived elegantly; enclosed in their signature pack, and with a neat little note personalized for the occasion. I was very impressed by the level of style and attention-to-detail that was built into the experience. The debossed-logo envelope that carefully held its precious sock contents, made me feel important about opening it, and that there was something special to be expected inside. I certainly wasn't disappointed, as I neatly lifted out two very handsome (and soft) samples from their men's collection. Already, I was intrigued, as I had never paid too much attention to men's dress socks before. With The Sartorial Set, you are able to select four designs to fit into this impressive packaging. Now, let's check out the 'Smith Dalmatian' & 'Wilde Floral' styles. Nothing says good style sense like a pair of perfectly-accessorized socks. Socks can strike up a conversation, tie your entire 'look' together, and even make you feel bold and absolutely, well, dapper :) I called on my trusty men's model to show off these particular styles. While we patiently waited for some sun, we decided to stroll around the city center, noticing all of the fresh flowers and urban wildlife - it was a perfect day for a photo shoot, at least for as long as the sun held out. *Note, some of the photos in this article were provided by The Dapper Collection, so be sure to check out their site for more styling tips! As we meandered down the fountain-focused path, it was a great opportunity to catch the colors of the Wilde Floral sock against the texture of the water. It was an especially appropriate design for the day, as the flowers around were bright and cheery, capturing the same essence as the thoughtful hibiscus rose design. I could definitely see this style be used as a wedding gift-favor or for the groomsmen during a Summer or destination wedding. In fact, The Dapper Collection offers a Bespoke Monogram Service for just that sort of thing; very clever, indeed! Headed for the office instead? Any of the collection's styles could easily pair with a handsome suit for a put-together look. Perfect for the gentleman-on-the-go. Do you have a favorite style? My personal favorite has got to be the Dalmatian...it's both classic and friendly. The colors of this style would seemingly complement a nice dark suit, or quickly dress up a casual khaki or jeans look. After a much-anticipated thunderstorm interrupted the shoot, we decided to head out to the lake for to photograph the Smith Dalmatian style the next morning. It was a calm, cool day and the weather-worn wood from the lookout points were attractive in making this charming style stand out. I don't know what it is about the Dalmatian, but the breed itself exudes a certain sense of intelligence, sophistication and style; all the things you would want your socks to convey about you. Would you agree? 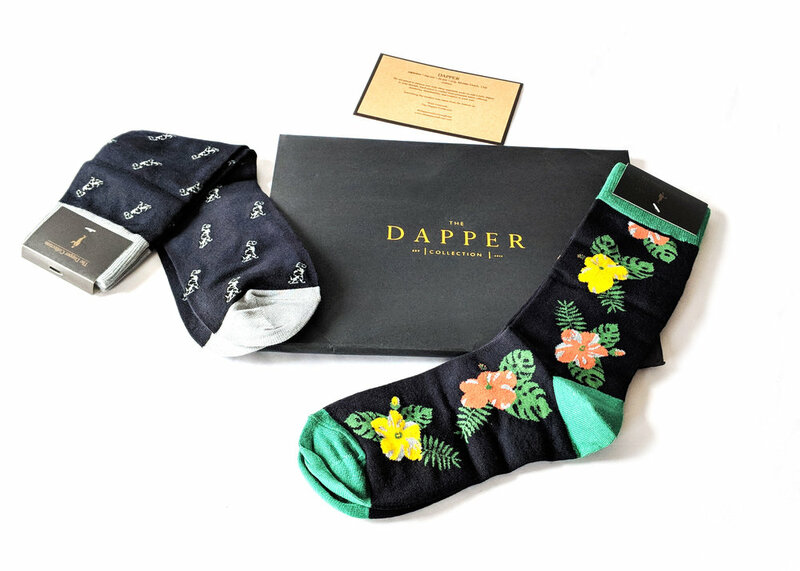 Overall, I'd give The Dapper Collection socks a 'thumbs-up' for quality, design and branding. Right off the bat, it's apparent that these are on-trend, and original designs exclusive to The Dapper Collection. Everything from the design to packaging is 'on-point' for its intended clientele. I hope you have thoroughly enjoyed this week's featured collection, and if you're interested in learning more about the brand, the creator, the materials or the story, please check out the links below! Sockabu - You'll Just Flip Over These Cute Kids' Socks! Happy Tuesday, readers! It is our pleasure to introduce our featured brand for the week! Meet Sockabu, the cutest toddler socks...but there's more than meets the eye here. Sockabu socks boast both a fashion and function-focus, and are versatile in their use, as they can be worn in an open or closed position to either 'free' or 'cover' your little one's toes! With the ease of a simple flip of the toe-cover, your young one can be more comfortable; whether it's play time or nap time, who doesn't love being able to choose? These soft and seamless styles are currently available in unisex designs for ages 1-4, and include a non-skid logo on the bottom of the foot for some traction while moving around. We also love that these are made in America! (In North Carolina more specifically). Knitting mills are extraordinarily fascinating to us, and we love seeing brands support their local economies. If you check out the Sockabu site, you can watch a video of how Sockabu came to be, and 'meet' the creator, Abbie - she's got such an amazing energy for the product, and it's always quite lovely to hear about the inspiration behind the product. You can learn all about the brand here. We've certainly concluded how cute and fashionable the gender-neutral stripes are...Now, let's take a closer look at how the product functions - The Sockabu style comes flat in the open-toe position, where your toddler can explore their world of activity without toe restriction. Toe seams and loose yarns (or floats as we call them) inside some socks can be restricting and bothersome for small children, especially when they cannot communicate their discomfort. The Sockabu styles allow for exposure of the toe area, allowing children to explore their own natural balance and tactile awareness. However, there are times when you might want to cover those sweet little toes, like for sleeping, or wearing with shoes...in which case, simply pull the little cover over and essentially you will have created what resembles a traditional sock. It's easy, it's cute, and it's comfortable - and that is what makes Sockabu feature-worthy! We wanted to be sure to show off all the fun colors used in these neat little knits, so we constructed a little bit of a fun "playground-inspired" photo shoot for the socks, since we didn't have any little ones of our own running around the studio. From a design standpoint, the use of primary colors is brilliant, and including a playful, yet simplistic and modern logo pairs perfectly with the branding. We really enjoy the use of color, especially when the Sockabu styles are in their different modes. When the toe area is open, you see most of the stripes, but then when the toe is closed, you get a surprise pop of color (red or green in the styles above). Love the design, love the coloration; we even think that touch of black in there is appropriate, as it adds a bit of sophistication to the palette. There you have it, readers - another lovely addition to our featured brand write-ups. We hope you enjoyed reading a bit about Sockabu, and that you'll share your interest and curiosity with your friends and fellow sock-enthusiasts! Until next time, keep up your sock game! Hey, readers! It's Tuesday, and I hope you had a spectacular weekend & holiday. Maybe you hit the beach, like we did over here at The Sock Review. A trip to the sand and surf wouldn't be complete without some cool socks to go with. This week's featured socks are from a skate/surf lifestyle-inspired brand called MERGE4, based out of California. The brand collaborates with artists and musicians to produce exceptionally-neat graphics on their crew socks, available in men's and women's sizing. The two particular styles that we received to review, tastefully highlight an admiration for the American ska punk band, Sublime - I'm sure you've heard a few of their songs ;) - cue radio, "What I Got." Coincidentally enough, the process used to create the imagery on the socks is called 'sublimation' - thought I'd just throw that out there. Aside from the vivid colors and imagery, these socks feature a padded sole (yes, we usually flip all of our sock samples inside out to see what they're made of), arch support, ribbed leg, and Y-heel stitch on the heel, that helps for proper fit. 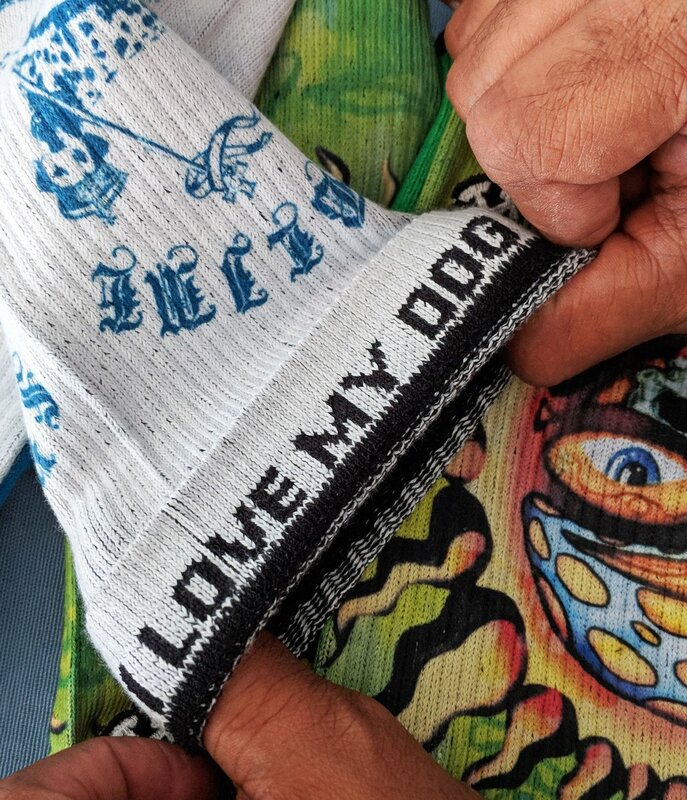 One interesting feature that stood out was the "hidden message" or "Fortune Cookie Quotes" right inside the the welt/cuff, which you get a sneak peek of when you put on the sock. The Sock Review always appreciates products that promote a sense of curiosity. Okay, so we took these out on the beach to give off the good vibes. Let's talk about the design a little more; again, such attention to detail, as you'll notice on the toe area, the formation of two arrows coming together (a tie-back to the brand logo elements), but I thought that was interesting, as I've seen straight lines done before, but not a particular shape. 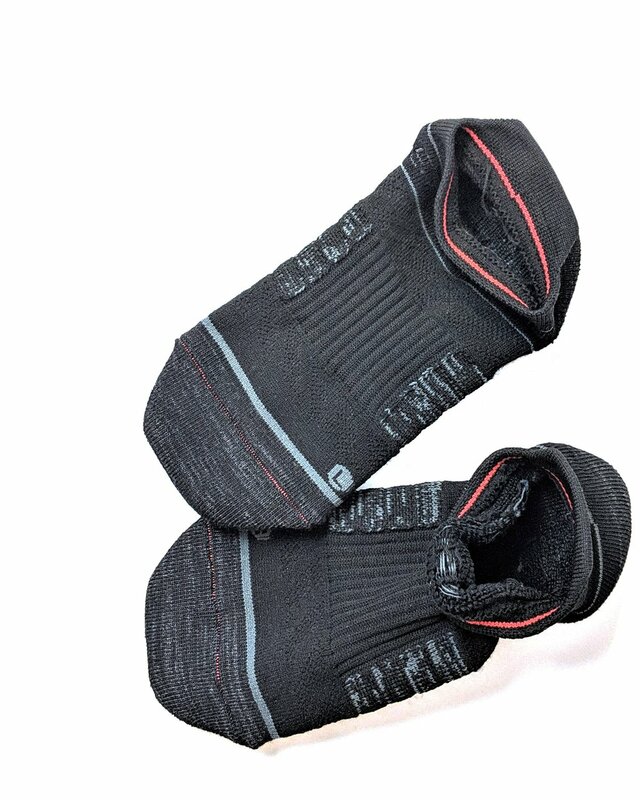 What's neat is that the printed design on the body of the sock is select, so while the graphics on the front are printed, you'll find a knit-in logo on the sole of the sock. The Sock Review absolutely loves the mixing of technologies; I wonder how far it could go? So, we talked about the hidden message, pictured here on the left, and now we'll talk about the good things that MERGE4 does for its community and its impact on the planet. MERGE4 is a certified B corporation, which is really a cool thing; it essentially means they respect and adhere to a responsibility to their community and the environment through a set of standards. You can check out some of the things this particular company does to strive for those standards, here on their "Corporate Responsibility" page. You can also learn more about B Corps, here. As social media and video presence is simply 'the norm,' for brands - it's always interesting to see sock products/brands with their own YouTube channel. I believe the videos help to connect more the digital and "human" part of a product. With so much shopping done online, isn't it good to know a little about the who/what/wear of the products you purchase? Definitely check out their 'videos' page on their site - you can find that here (or search MERGE4 on YouTube.) It's always nice to see the people and inspiration behind the action. All in all, love the energy of the sock designs and appreciation for art and music culture, built right into the socks. Hope you all enjoyed this Tuesday feature, we'll be back with more next week! Check out the links below where you can find out more about MERGE4 products and lifestyle. Where to purchase: MERGE4 online shop and store locator here. Good day, readers! This week's sock blog feature is Feetures, a sock company that is focused on bringing performance into everyday wear with their Everyday sock collection. Who else loves to wake up early enough each morning to take a brisk walk, or even just a short loop around your building at work in the afternoon? Maybe you're looking for a sock that you can feel comfortable lounging around in, or that you can even dress up for the evening. 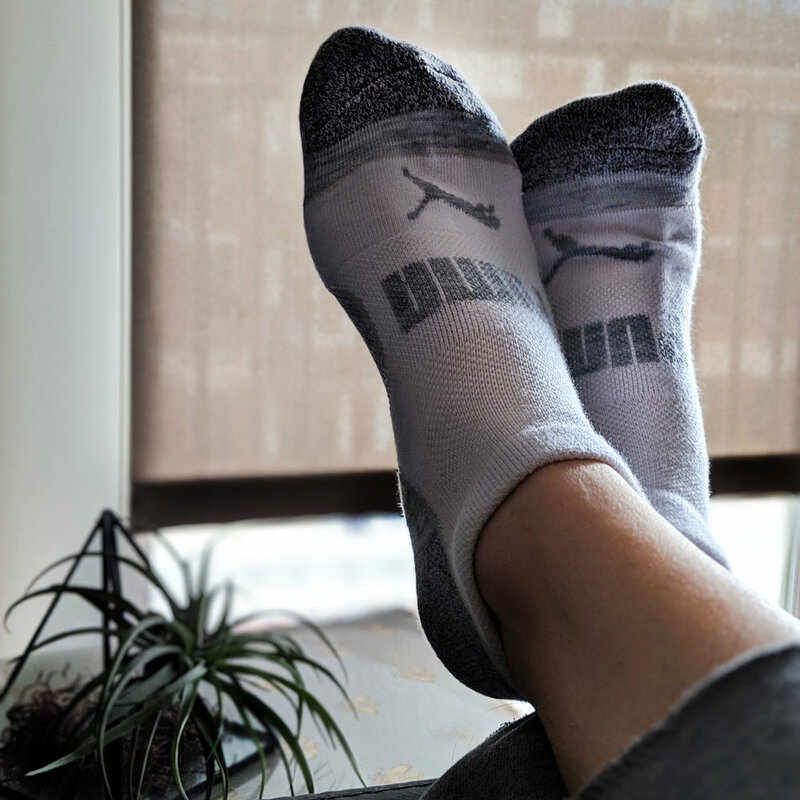 The Sock Review would like to introduce a great 'everyday' sock that utilizes moisture-wicking fibers and targeted compression to make your everyday activities like walking or lounging, even better. Feetures is known for its superb running socks, but we love these patterned styles that are available for less-demanding activity. Styles pictured here are available in different options on the Feetures website. If you're curious to see more patterns, or their other sock collections, we encourage you to check them out! 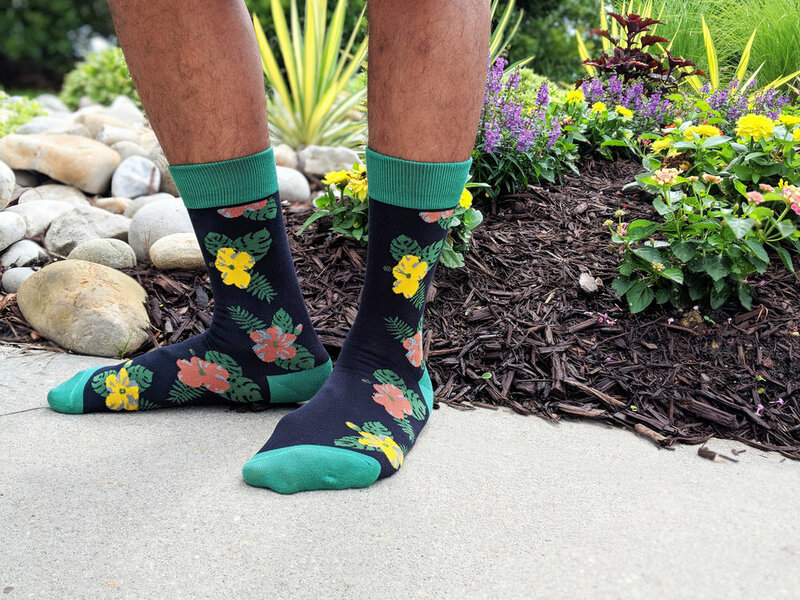 As is in the tradition of all the samples that arrive here at The Sock Review, we always try them out for ourselves, and, if weather permits, we love to take them outdoors! Since I'm a fan of a walk on a bright, sunny morning, I chose to try out the women's Horizon Cushion Crew (in navy) with my favorite walking shoes. At first, I didn't realize the socks were left/right-specific, which I quickly discovered when I placed them on the opposite feet (it's great, they have an "L" and "R" by the toe), and realized that the support features of the sock were designed to fit its designated foot better. Once on, I could feel the cushioned foot bottom in this pair immediately, as I began to walk. I would definitely choose this style again for another everyday look. If you're someone that works in a traditional-office work setting, these would be great to pair with a casual outfit, since they are comfortable when sitting as well (I'm wearing the women's Sante Fe Ultra Light crew in Oatmeal right now as I write). So what are some of the different features that are available in the Feetures Everyday socks? One notable call-out called 'targeted compression,' shown below, helps to add to the comfort and support while wearing. I also really like the fit of the heel of the sock; it didn't feel like it was going to slide around on me. This is due to the Y-heel construction (if you look closely at some socks, you may notice what looks like a "Y" stitch on the heel, which helps the sock to hug the foot heel better than a straight stitch.) I mentioned previously about the L/R specific fit of the socks, which is one of my favorite attributes. Another great feature of the Feetures socks pictured here is the seamless toe - the thought of an itchy or bothersome toe seam being in the way is eliminated here, with the placement of the high-quality hand-linked seamless toe construction. Want to learn more about all of the features mentioned here? Be sure to check out the Feetures website for more, or simply conduct your own set of sock construction research online; I promise, there's quite a lot to learn and know about socks! I hope you all enjoyed today's "Feetures feature" - as it is always a pleasure to represent quality sock brands and products out there on the market. Please comment below if you have tried out a pair for yourself, or if you have any questions about this post. Happy start to the new week! Where to purchase: You can shop online or find a store that carries the brand near you! Make it a fashionable Friday with these simply exquisite 'works of art' for your feet any art collector would be proud to wear. Happy Friday, readers! Today's featured sock collection is a brand new collaboration between active lifestyle brand Able Made and The Metropolitan Museum of Art, both organizations I admire each for their accomplishments in their respective fields of product design, fashion and art. The Able Made x The Met sock collection of 18 styles offers soft, high quality cotton socks for women and men, inspired directly from pieces that can be found in the museum's own art collection. From the hieroglyphically-patterned 'Egyptian Eyes Socks,' to the sophisticated 'Degas Dancer Socks,' inspired by one of my very own favorite pieces by Edgar Degas, there is sure to be a style that fits everyone's taste in art, and socks. You can view the entire collection (and other gift-able goodies) in person at The Met Fifth Avenue, where they are available for purchase. You can also learn more about the pieces that have inspired the socks by clicking on the images (or better yet, take a trip to The Met, which I absolutely encourage). Art is just one of those things you have to experience for yourself, don't you think? Something about those eyes...something about eyes on socks in general is very mesmerizing in my opinion (and trendy!). This particular pair, called "Egyptian Eyes," is available in a very wearable-yellow body with knit-in decorative detail. I chose the sandy-yellow version because it's such a fun color, and made me think of the sands of Egypt. This "eye" motif is pulled from the artistic detailing on the Coffin of Khnumnakht, a piece currently on view at The Met Fifth Avenue. (Click the photo above to learn more.) I absolutely loved shooting this photo by the sand, just as sunset approached; gathering a dramatic image, which I thought was appropriate for the style. The deep red heel, toe & cuff accent the bold colors elegantly. I think this would make an excellent addition to a suited style if you want to dress up at the office. Now, on to one of my personal favorite styles from the collection; the "Degas Dancer Socks" - inspired by a drawing titled, Dancer, created by Edgar Degas, featuring a ballerina. It's really the bold blue bow that resonates with me when I viewed the original artwork, and is translated nicely in the sock pictured above. I love the light heathered-blue accents on the design, and the simplified silhouette of the dancer still being very recognizable and familiar; a lovely translation of the artwork, and very wardrobe-friendly. You could easily style these with a summery knit top and some denim, or even dress them up with a look to parallel the dancer's. Either way, this is a great way to not only show off your unique style, but also a way to show your support of The Met's dedication to art and design. If it's abstraction you need more of in your life, then I suggest taking a chance on these Mondrian-inspired socks for your outfit of the day. The geometric pattern and bold colors inspired by a piece called Composition, by Piet Mondrian, will brighten up any mood and add a grid of sophistication to your look. Who could resist showing off their socks when they look as good as this? Pair them with dress shoes, or if you're doing a bit more walking, dare I say these would make even a pair of sneakers look amazing! For the last pair I'm highlighting, I wanted to capture the simple beauty of the dragonfly pattern in this women's sock style. The dragonfly graphic is inspired by a jewelry/hair piece designed by Louis Comfort Tiffany, which looks very delicately constructed, being made out of precious metals and jewels. The dragonflies in the sock are quite nicely placed in a neat repeat pattern, which makes me think of Spring, hence, the floral arrangement in the background. I love the way the sun set slowly as I captured this image and highlighted the delicate colors of the sock itself. The "Dragonfly" style is a soft, comfortable addition to your warm-weather style, offering a light, tonal look. I hope you sincerely enjoyed reading about these colorful and uniquely fashioned sock styles. It's an 'art' in itself to get designs to look good on a sock/knit surface, and I believe this collection of artistically-inspired socks has done this successfully and uniquely. If you would like to shop for a pair of your own, or learn more about The Met and Able Made and their missions, please check out the links below and most of all, show off your socks this Spring! Special thanks to The Met for sending The Sock Review some of these amazing sock styles to check out; I'll definitely be wearing them all! Where to purchase: 18 styles currently available in-store at The Met Fifth Avenue. Your purchase supports the Metropolitan Museum of Art's efforts in art collection, study, conservation and presentation. *The Sock Review was provided with free product in return for an honest review. All thoughts and opinions expressed herein are my own and not influenced by the developing company, and/or its affiliates, in any way. Hi readers! Ever wonder 'how' and 'why' The Sock Review came to be? What started the discussion, and what set me on a path to promote and highlight excellency in sock design? I wanted to take this post to share with you my "origins" story! I hope you all enjoy, and I'd love to hear how you got interested in socks in the comment section, below. It probably all subconsciously started in elementary school, when I had a fluffy grey cat named "BobbySocks" leap out of my arms and race through the slim halls, right into my English teacher's room - *ahem* on a show & tell day. Yes, I retrieved him, scratch-free. He had what looked like the sweetest little "fur socks" on his legs. Fast forward to high school, when I very proudly wore mismatched socks to accessorize my unique sense of style. Some days, I dressed in all "metallics" to pretend I was a robot, and some days, I just didn't care what people thought of my shocking lime green "boys" Nike tee and short set (I got it in the boys' department, but didn't care - they didn't have that color in girls'), with of course, matching lime green socks. Somehow, my interest of exploration of fashion concepts & a slight knack towards science led me to pursue a degree in Industrial Design. After graduation, I gained a lot of experience in the product design field, and eventually ended up with a very interesting focus in legwear & accessory development & design (which to this day, it all sort of makes sense.) At one point, I was interviewing with a prospective company for a position, and one question they asked that stood out to me was, "Why do you want to work in sock design?" And my response was..."I pretty much wake up and fall asleep thinking of sock ideas" As silly as that may sound, it's true! I'm a sock geek! It's quite thrilling to have the constraint of a simple silhouette like the sock, and think of the many different ways you can alter it, or maximize within. I know, probably sounds a little Out There, but it's what made me begin writing about socks. I needed an outlet where I could share my passion for the legwear industry; and thus, The Sock Review was born. With an unattended email account ( I never expected anyone to actually email me, and so, I think I missed out on a few early opportunities) but after a few experimental and personal posts with socks I purchased myself, I began receiving sock submission requests. The rest is of course, history. Now, I am happily overwhelmed by sock samples, and hope to continue to further the mission of The Sock Review as a blog and sharing platform. My future goals always involve improving content quality and perhaps a glimpse into some trend forecasting. I'd love to do more interviews with sock-related professions or things of that nature. What would you all like to see from The Sock Review in the future? Thank you to all my readers and social media supporters! Hi readers, it's been a little while since The Sock Review's last feature, but rest assured, something excellent is cooking! We took a short hiatus to recharge, relax and review our year so far. 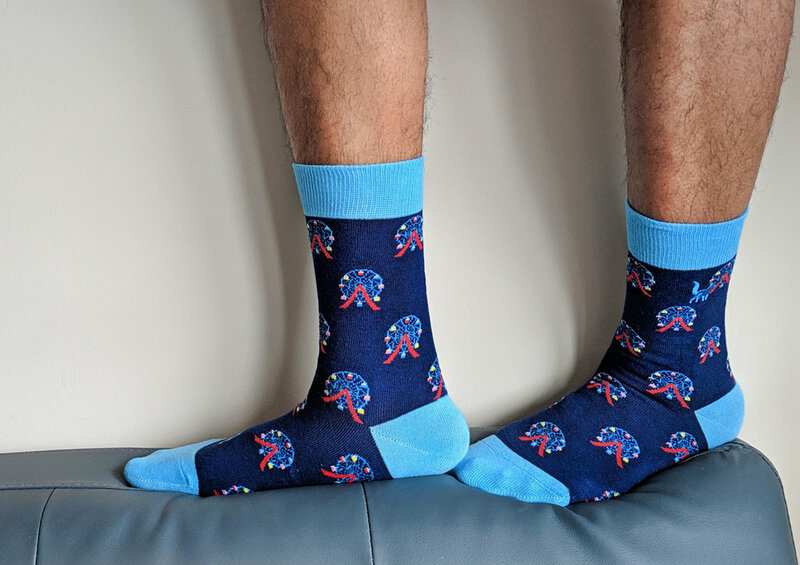 Something we want to always be mindful of is providing our readers with valid, valuable and quality content about, well, nothing other than socks! Sometimes, moving forward actually requires a small step back to analyze; which we've done. Now, we've got a clearer vision as a result. Excited to continue onward and upwards with you all. Keep an eye out for our next post - we're trying something a little different! Art - a place for the mind to wander; to enjoy and relax or to reflect deeply about the content of a piece. Today, we feature Imagery Socks; a San Diego, CA brand that focuses on featuring very well-known pieces of artwork, intricately knit in to their socks, and designed with women's style in mind. The artwork featured on the socks is easily recognizable as some of the most famous paintings in history, and we absolutely love how well they represent their artistic inspiration. From Sandro Botticelli's, The Birth of Venus to Salvador Dali’s The Persistence of Memory, Imagery Socks takes inspiration from beautiful art pieces and transforms them into wearable masterpieces worthy of styling. The care and detail of selecting the colors for the background and accents of the sock are very appropriate and harmonious. I can appreciate the attention to detail here, having enjoyed many hours roaming the rooms of various art museums myself. How fun is it to wear a part of the art experience on your feet! In case you are more curious about each art-inspired sock style, you can read more about each style and the painting it was inspired by, all by viewing the style's story on Imagery Socks' website. For example, if you want to learn more about Gustav Klimt's The Kiss, (one of my personal favorites), you can read a short description there - and I encourage doing a little research on the piece online as well (just make sure you are looking at a reputable source.) And if you can't make a round-trip to Florence, Italy or the MoMA, you can always head to your local art museum for an immersive and one-of-a-kind experience on many other pieces. I can't say enough on how amazing it is to experience a painting in real life. The quality of the sock is no less lovely than the artwork, being made of a combed cotton blend, this sock will feel great on your feet, and you'll be showing off your appreciation for art; a win-win! We hope you enjoy these as much as we do! Enjoy the week, friends - keep those great sock brands coming. Special thanks to Imagery Socks for providing us with some amazing sample styles to photograph and review!